Medical Degree programme is one of the hardest degree programme to enroll in Srilankan Government University, because only Srilankan government universities would provide such qualification in srilanka. None of the private was allowed to do so other than SAITM. Therefore there is huge demand to study medicine in Sri Lanka or aboard most of the students are looking forward a Russian Medical Universities or Indian Medical Universities like Manipal Medical College and the other option is studying in China. 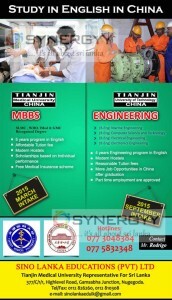 Whenever you thought of studying medicine in china, the first name blinks is Tainjin Medical University of China. and now Tainjin Medical University offer medicine degree in English Language. so this is a great opportunity for srilankan to finish studying sooner than learn chines there for an year.